ABU ROAD RAJASTHAN, India – Brahma Kumaris, World Renewal Spiritual Trust has recently constructed Godlywood Studios in its Shantivan Complex at its International Headquarters at Abu Road, Rajasthan. This highly advanced electronic media studio creates television programs and films dedicated to spreading spiritual knowledge and Raja Yoga meditation. This ambitious studio project is intended to create and air various spiritually oriented TV programs and films was conceived and initiated by BK. Ramesh Shah, Managing Trustee of the Brahma Kumari Organization. To help achieve this vision, Godlywood Studios has installed a HARMAN Studer Vista 1 mixing console to serve at the heart of its audio system. The Brahma Kumaris, World Renewal Spiritual Trust organization is spread over 138 countries with 8,500 centres. Following BK. Ramesh Shah’s vision to create a world-class studio with all functional infrastructure facilities under one roof, the implementation of this project was handed over to Shri. Haridas Bhanushali (BK Harilal). Under the leadership and guidance of BK Harilal, the team executed this project in a short span of one year. Determined to create a modern facility with world-class tools and equipment, Godlywood studios enlisted a technical committee comprised of BK Shiva, Shashi Mekal and Gerard Goveia of Broadcast Media Equipments Pvt Ltd (BMEPL) along with Ashish Barje, Sales Manager, Recording & Broadcast, HARMAN Professional India. 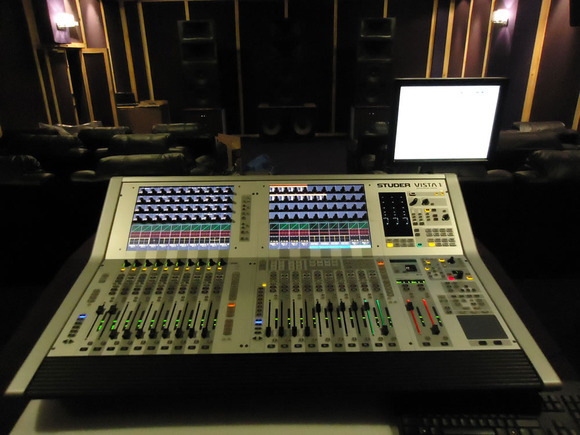 The team selected HARMAN’s Studer Vista 1 mixing console to serve at the heart of the studio, marking the first installation of a Studer Vista 1 in India. “The Brahma Kumaris World Spiritual Organization [BKWSO] chose the Studer Vista 1 as the perfect fit for Godlywood studios because the primary requirement was that of a compact solution without compromise on system performance, DSP capability or reliability. The Studer Vista 1 enables us to have the control surface, I/O system, DSP and power supplies all contained within one very small footprint console,” said Shashi Mekal, Technical Head, Godlywood Studios. The BKWSO was also impressed with the Vista 1 for its user-friendly, easy-to-learn interface and unique functionality with its Vistonics™ user interface and 40 on-screen rotary knobs. Using Studer’s unique Virtual Surround Panning, the operator can take mono sources and create a realistic sound field for a film quickly and easily. The system integration for the project was performed by TASS Services of Mumbai. AVF Distributors, the authorized dealer for HARMAN’s broadcast range, supplied the console to Godlywood. In addition to the Studer Vista 1, Godlywood Studios deployed a full array of HARMAN technologies in the space, including three JBL 3730 ScreenArray cinema loudspeakers, one JBL 4642A subwoofer and eight JBL 8320 compact cinema surround loudspeakers. The system is powered with five Crown DSi 1000 and two DSi 4000 amplifiers.